Strawberry Blood Orange Mojito is a refreshing cocktail. Strawberry Blood Orange Mojito recipe is easy, quick, beautiful and taste delicious. This Strawberry Blood Orange Mojito recipe is an alcohol-free version. Strawberry Blood Orange Mojito can be made in your cocktail shaker. 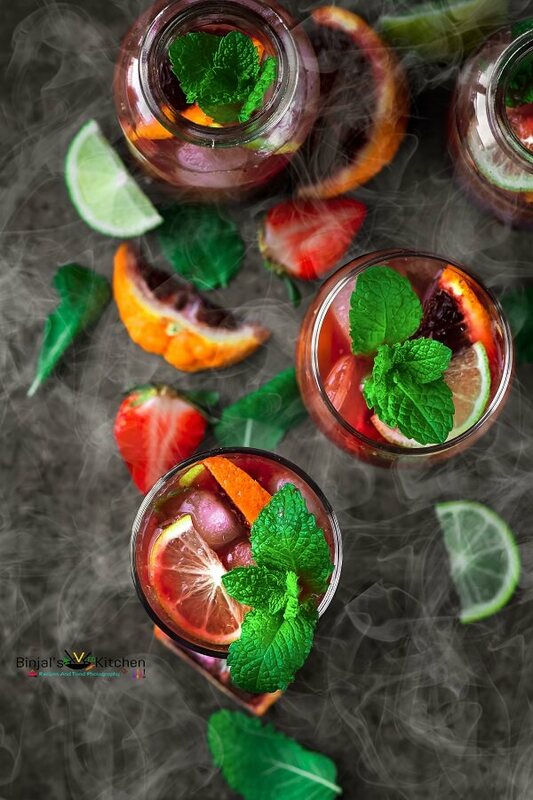 This Strawberry Blood Orange Mojito recipe uses strawberry, blood oranges and a little mint to make a drink that is beautiful and delicious. In this cocktail, I used fresh squeezed blood orange juice, juice from mashed Strawberries, some sugar, and sparkling water (soda water). 1. Take a cocktail shaker or a big bottle. Add strawberry, blood oranges juice and mix it. 2. Add sugar, lemon juice, mint leaves, pinch of salt and shake it or mix it well until all sugar get dissolved. 3. Take a few serving glasses and fill it ¼ with the prepared juice, then add ice cubes until ½ glass. 4. Now add sparkling water until ¾ of glass full, then add remaining juice on top, garnish it with lemon-orange wedges and mint leaves and serve chilled. • You can make a fruit juice your own at home from fresh strawberries and blood oranges. • Instead of sugar you can use honey as per your taste. • You can skip salt, I just added because a pinch of salt makes a cocktail tasteful. Take a cocktail shaker or a big bottle. Add strawberry, blood oranges juice and mix it. Add sugar, lemon juice, mint leaves, pinch of salt and shake it or mix it well until all sugar get dissolved. Take a few serving glasses and fill it ¼ with the prepared juice, then add ice cubes until ½ glass. Now add sparkling water until ¾ of glass full, then add remaining juice on top, garnish it with lemon-orange wedges and mint leaves and serve chilled. Can I make the juice in advance like for a party and assemble the cocktail in front of guests? Where do you get Blood oranges? Yes you can! bought it from Wegmans!